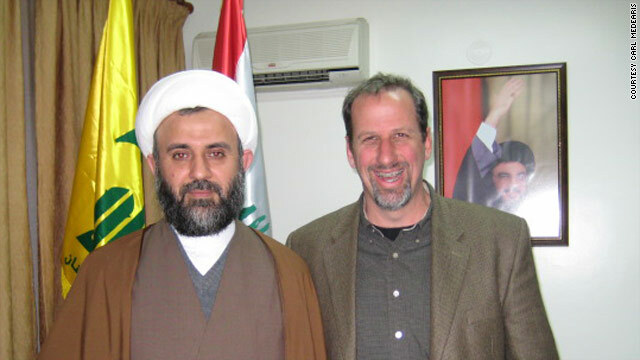 Carl Medearis with Sheikh Nabil Qawouk Hezbollah’s number two leader. Editor's Note: Carl Medearis is an international expert in Arab-American and Muslim-Christian relations and is author of the book Speaking of Jesus: The Art of Not-Evangelism. Let’s do an exercise. I want you to fill in the blank on what you think you know about me based on what I’m about to tell you. Here goes: Twenty years ago, I became a missionary. My wife and I left our home in Colorado Springs, Colorado to move to Beirut, Lebanon. Our job description was to plant churches and evangelize to Muslims. Based on what I just said, Carl Medearis is a ______________ . Carl Medearis is a... hero of the Christian faith, a saintly super-man willing to sacrifice the comforts of home in order to share the love of Jesus Christ with those who have never heard the gospel. Carl Medearis is a... right-wing extremist who destroys cultures, tears apart families and paves the way for neo-colonialist crusaders to invade, occupy and plunder the resources of local populations. Quite a range, isn’t it? For one group of people, the words “evangelist” and “missionary” bring to mind pious heroes performing good deeds that are unattainable for the average Christian. For another group, those same words represent just about everything that’s wrong with the world. Based on my experiences of living and traveling around the world, I know that religion is often an identity marker that determines people’s access to jobs, resources, civil liberties and political power. When I lived in Lebanon I saw firsthand how destructive an obsession with religious identity could be. Because of the sectarian nature of Lebanese politics, modern Lebanese history is rife with coups, invasions, civil wars and government shutdowns. When I tell my Christian friends in America that some of the fiercest militias were (and are) Christian, most are shocked. It doesn’t fit the us-versus-them mentality that evangelism fosters, in which we are always the innocent victims and they are always the aggressors. This us-versus-them thinking is odd, given that Jesus was constantly breaking down walls between Jews and Gentiles, rich and poor, men and women, sinners and saints. That’s why we have the parable of the Good Samaritan. Jews in Jesus’ day thought of the Samaritans as the violent heretics, much the same way that Christians think of Muslims today. The idea that a Samaritan could be good was scandalous to first century Jews. Jesus was the master of challenging religious prejudice and breaking down sectarian walls. Why do so many Christians want to rebuild those walls? Even the Apostle Paul insisted that it’s faith in Jesus that matters, not converting to a new religion or a new socio-religious identity. What if evangelicals today, instead of focusing on “evangelizing” and “converting” people, were to begin to think of Jesus not as starting a new religion, but as the central figure of a movement that transcends religious distinctions and identities? Jesus the uniter of humanity, not Jesus the divider. How might that change the way we look at others? This is more than just a semantic difference. Encouraging anyone and everyone to become an apprentice of Jesus, without manipulation, is a more open, dynamic and relational way of helping people who want to become more like Jesus — regardless of their religious identity. Just because I believe that evangelicals should stop evangelizing doesn’t mean that they should to stop speaking of Jesus. I speak of Jesus everywhere I go and with everyone I meet. As founder and president of a company called International Initiatives, my work is aimed at building relationships among Christian leaders in the West and among Muslim leaders in the Middle East. It may come as a surprise to many Christians that Muslims are generally open to studying the life of Jesus as a model for leadership because they revere him as a prophet. But now that I’m no longer obsessed with converting people to Christianity, I’ve found that talking about Jesus is much easier and far more compelling. I believe that doctrine is important, but it’s not more important than following Jesus. Jesus met people where they were. Instead of trying to figure out who’s “in” and who’s “out,” why don’t we simply invite people to follow Jesus — and let Jesus run his kingdom? Inviting people to love, trust, and follow Jesus is something the world can live with. And since evangelicals like to say that it’s not about religion, but rather a personal relationship with Jesus, perhaps we should practice what we preach. The opinions expressed in this commentary are solely those of Carl Medearis. Next entry »Is 'Christian fundamentalist' label correct for Norway terror suspect? Carl, it sounds like your ashamed of the words of Christ. Have you never read: Romans 10:17 So then faith comes by hearing, and hearing by the word of God? or how about: Luke 9:26 Whoever is ashamed of me and my words, the Son of Man will be ashamed of them when he comes in his glory and in the glory of the Father and of the holy angels. I got to say the part of you talking about not wanting Muslims to convert to Christianity because of family seperation is against Gods word. Mathew 19:29 And every one that hath forsaken houses, or brethren, or sisters, or father, or mother, or wife, or children, or lands, for my name's sake, shall receive an hundredfold, and shall inherit everlasting life.